Sadie has been gone a few years now but she lived almost 13 years and was loved very much. 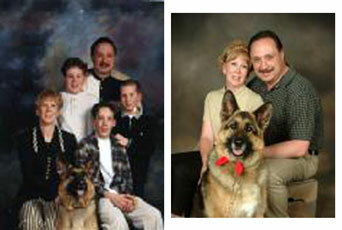 She was a great family dog and the 4th GSD I have had in my family situation. My first started when I was in 1st grade and I am pushing 60 now (Ouch!). In the young Sadie picture she was under two and the other picture she was over 10 years of age. The kids are grown up now and moved on. My wife was in a tragic car accident in 2003 and the picture of us with Sadie was one year after the accident which she felt good enough to have her picture taken. The picture of just us with Sadie is the best picture I have of her (THE DOG LOL).... She was a beautiful girl!! Presently I am retired and remodeling the house but when I finish I think I am being coerced into getting what will be my 5th GSD. Although I have been around GSD's all my life this one will be new experience to me since we have always had "Kids" around. Kids keep the dogs busy and vice versa. It seems unnatural for a German Sheppard to not have kids if you know what I mean. I guess I will have to find kids in the neighborhood to play with the dog a lot during the first year. I am concerned about the GSD and what is happening to the "American Show" breeds and there lower backs. Sadie had a pretty straight back and I think it's sad what is happening to the breed in that respect. I have seen some YouTube videos of show dogs that reminded me of Hyenas! Do you have any input for me on this? Advice is always welcomed. Do you know have any good breeders in the North West. I can't even remember what breeder we got her from. Maybe I can dig up her paper somewhere in a box in the garage LOL. That would be a miracle!! Anyway thanks for the good website!! Let me say right up front to Steve, Sadie’s dad, that I am so very sorry for your loss of your German Shepherd Dog, Sadie. I am so very sorry for the loss.